OSHA states that the top hazards associated with aerial lifts are electrocutions, falls from elevations, tip-overs, collapses, being struck by falling objects, and ejections from the aerial lift platform. If you’re a construction worker and you operate aerial lifts or are consistently around them, it is essential to your safety to complete an aerial lift certification course and learn about the hazards that cause injuries and deaths every year. 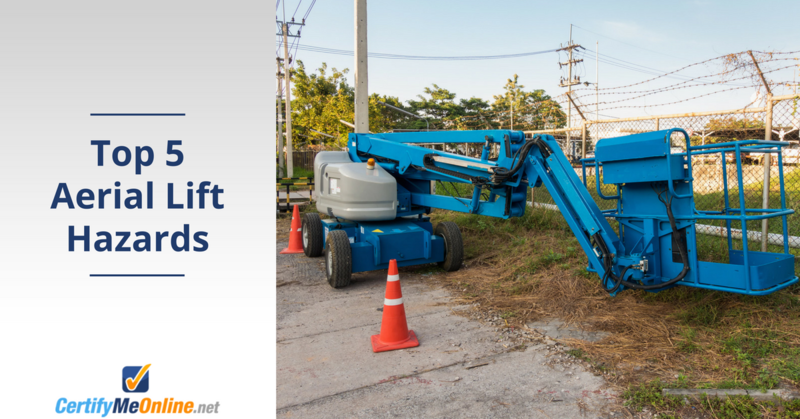 Complete your aerial lift safety training and you’ll be properly prepared to recognize and avoid these top hazards associated with aerial lifts. CertifyMeOnline.net is the online leader in OSHA-approved training. Our aerial lift training and certification course covers everything you need to avoid aerial lift hazards. Choose from seven different aerial lift hazard training sessions. All of our coursework is designed to help you and your co-workers become OSHA certified with no hassle – all with affordable prices! Regardless of your job title, it helps to be aware of the following aerial lift hazards. – Always wear fall protection equipment and never belt off to a pole or structure other than the lift’s attachment points. – Do not position the lift between overhead power lines if possible. – Treat all overhead power lines and communication cables as live, and remain at least ten feet away from them at all times. 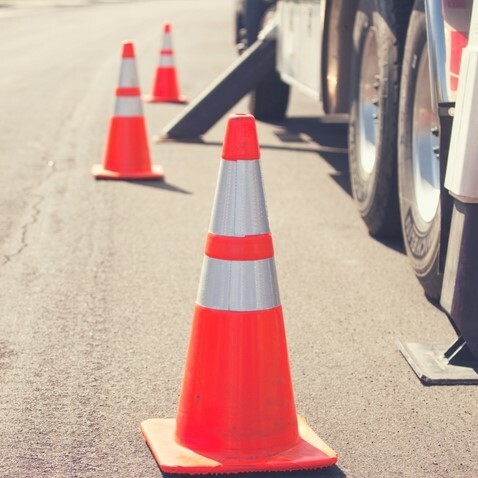 – Be sure to have workers de-energize power lines that are in the work zone before beginning tasks, and wear protective gear like insulated hard hats, gloves, boots, and clothing. Always adhere to your company’s personal protective equipment (PPE) policies. This includes the proper use of safety harnesses, fall protection equipment, and other devices designed to protect you from falls from heights. Some aerial lifts and boom lifts pose serious hazards, simply because they’re so high. If you’re unsure about your specific role and have questions about aerial lift hazards, always keep an open line of communication with your boss, site supervisor, or safety coordinator. Tip-overs and collapses of the aerial lift are caused by improper traveling and handling of the lift. Sometimes they are caused by inadequate pre-start vehicle and mechanical inspections. Collapses may occur due to mechanical failures and can be prevented by workers completing thorough pre-operation inspections of the vehicle and lift to ensure all controls are working properly. To prevent tips overs and collapses, workers should not exceed manufacturer’s load capacity limits, never travel to a job site with the lift raised, never drive near holes or drop-offs, and never raise the platform on uneven or unstable surfaces, on sloped ground, or in windy weather. A widely cited study from 2013 illustrated the importance of measures to avoid tip-overs. In this case, a Montana aerial lift worker was killed when his equipment fell over on its side. Despite the potential for numerous violations, OSHA only imposed one on the company, which was failure to report the accident within eight hours. Bottom line: aerial lift safety is a responsibility everyone shares. Employers, employees, and all personnel involved with workplace safety play a role. Aerial lift hazards – including tip-overs – are waiting to happen. It’s up to alert, properly trained employees to take the steps necessary to avoid injuries and fatalities in the first place. In addition to the operators being at risk, workers on the ground are also at risk if any of these hazards take place. Most often, on-foot workers are injured or killed by objects falling from the aerial lift bucket or platform. It is often caused by lifts carrying objects that are larger than the platform, carrying unstable objects, workers not making sure all openings on the bucket or platform are closed, and coming into contact with a fixed object like a sign that causes objects on the lift to come loose and fall. 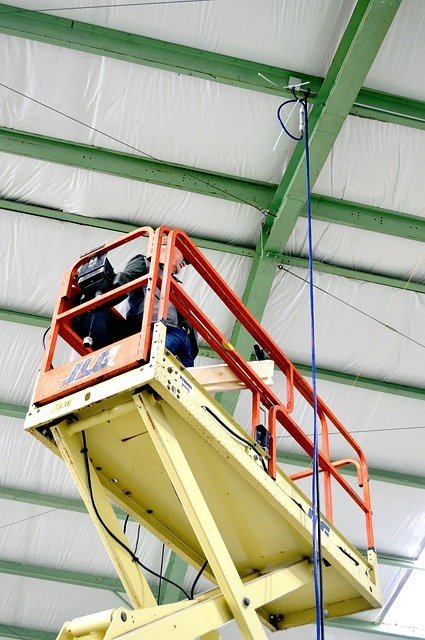 If possible, aerial lift operators should avoid positioning the lift underneath overhead objects, and workers on the ground should be aware of their surroundings and avoid working underneath or in close proximity to the lift when it is raised. When controlling and moving the aerial lift, operators must be aware of their surroundings and ensure they have clear visibility of everything on all sides of them, especially when working near a highway. In all cases, workers must always wear adequate fall protection equipment to prevent them from falling from the lift. This equipment involves wearing a full-body harness with a lanyard that is attached to the bucket or platform. Many of these aerial lift hazards – falls from heights, tip-overs, and ejections from lift platform, just to name a few – are directly related to one of the most widely-cited OSHA violations of 2017: Fall Protection Training Requirements. CertifyMeOnline.net helps everyone involved with aerial lift and scissor lift operation with a solid base of knowledge in all aspects related to safe, efficient aerial lift operation. In order for any pieces of safety equipment to be useful at preventing these aerial lift accidents, workers need to complete comprehensive aerial lift training to fully prepare them for avoiding these hazards and protecting everyone’s life on a work site. Check out CertifyMeOnline.net for aerial lift training that teaches everything you need to know about these dangers. If you’d like to learn more about aerial lift hazard safety training, please call our OSHA training experts today at (602) 277-0615. We look forward to helping you and your company become OSHA compliant – and thanks for stopping by the CMO blog.